I’m excited to have just finished my latest crochet project, but as it isn’t blocked yet the pattern will have to wait until next time. You’ll have to make do with the Instagram teasers for now! In the meantime, I’ve been continuing sewing with this midi circle skirt that isn’t quite a circle skirt. I ordered this pretty printed corduroy fabric with the intention of making a woven maxi skirt. However, I was obviously confused about which direction the corduroy ran in when I ordered because although I ordered enough the cords would have had to have run across the length rather than down it. Whoops. So new skill number one is to check the direction of fabrics with nap before ordering! I decided to go for a half circle skirt instead but also didn’t have quite enough for that, so this is a somewhere in between a half and a quarter-circle skirt. A sort of circle skirt. I self drafted the pattern using geometry. I knew the length I wanted and the waist measurement so I just went from there. I cut one piece for the front and split the back in two. This was so I could insert both pockets and a back zip. The waistband isn’t faced but I did sew in some slightly stretched elastic, which I suppose counts as facing. The corduroy has a reasonable amount of structure so I think this was ok (and it’s also why I got away without a lining). I made the waistband an inch bigger than needed, the elastic draws it in so it fits snuggly but I can still breathe/sit down. I wanted a close fit at the waist to emphasise the shape and I’m pretty pleased. The elastic-faced waist is my 2nd new skill in this project. 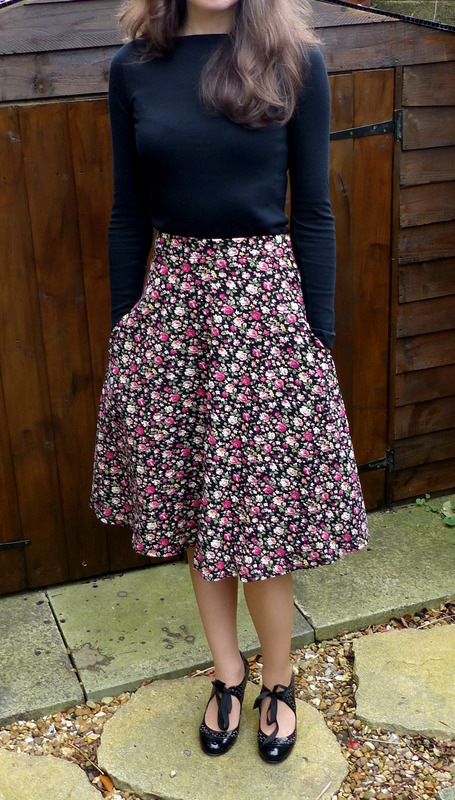 This is also my first time with circle skirts though I have drafted a pattern and sewn in pockets and zips before (like this one). Although the waistband was new to me, the hemline actually caused me more worry because it was curved more than any other hemline I have done. In the end I trimmed it with pinking shears and just turned it up once by 5/8” all the way around, so that I wasn’t trying to sew too much fabric into a smaller space. This worked fine though I’m sure there are better ways! This was a bit of a make it up as you go along project and I’m happy with the result, even though you can definitely tell it’s home-made on the inside and the pockets are positioned a fraction too low. Learning to finish seams nicely on different fabrics with just a sewing machine is something I’ll have to do some more research into! You’ll need a pattern paper piece which is at least “h” wide and “r+l” long so you can draft the curved hem and waist like you would if you were using a compass. If your “wedge” shape fits on your fabric when it is folded into quarters then you’ll have enough fabric, but don’t cut it like that as you’ll want the pieces placed in the same direction (with the nap). Cut the front on the fold and then cut two back pieces separately so you can add the seam allowance for the back seam. Make sure the waist has a little ease so you can breathe and use elastic like I did in the waistband if you want a close fit. Is the elastic sandwiched between layers? Or is it outer layer + elastic and nothing else? If it was the latter that’d be the elastic facing. But I don’t think I’ve ever heard of someone doing that — generally elastic is sandwiched between two fabric layers. My main guess as to why would be that elastic generally is very unhappy with oils, body oils included. Ever wear a rubber band on your wrist? They generally disintegrate within a week. Hi Tegan! Thanks for your comment and advice. I zigzag stitched the slightly stretched elastic onto the inside of the waistband before folding over to enclose all the edges. So it isn’t exposed at all – phew :) Re: wale problems – I knew there was a technical term for that, thanks! The fabric is very pretty and you did a great job! 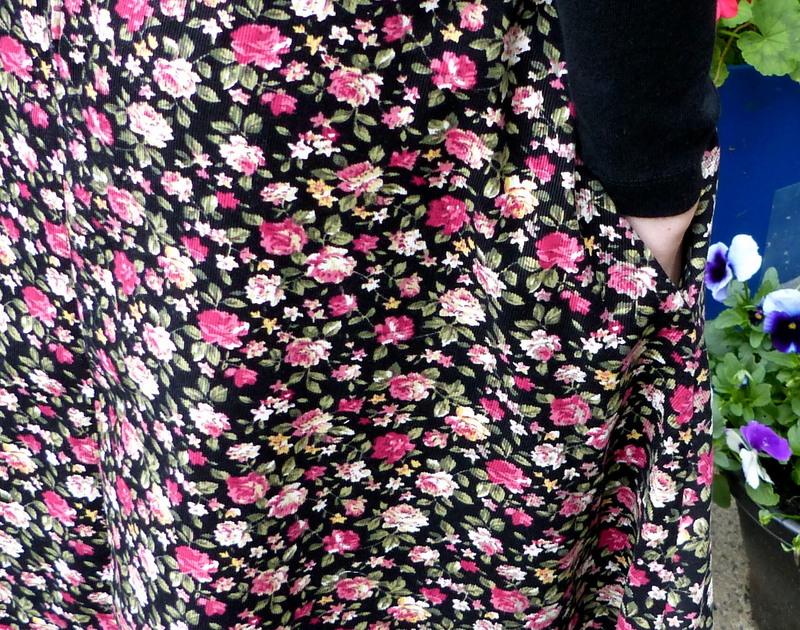 Esther, This is an absolutely beautiful skirt and I would love more details on how you did the pattern for it. I know it’s something that my daughter would love, and because it’s longer, I’d probably make one for myself as well. Thanks Joanie! There are lots of good explanations from people more talented than me about how to make full/half/quarter circle skirts, if you just google it. I will add a pdf sketch of how I drafted my pattern to the blog though, in case it is helpful! I adore the vintage vibe of floral corduroy (I loved it when it was the thing to wear, and have a piece in my stash), and I think you’ve been very creative with your cutting. This is a great make. On a cord skirt, you could you Hong Kong binding to finish off your seams. Thanks! And yes let’s bring back floral corduroy :) I’m off to google Hong Kong binding, thanks for the tip! Darling skirt. Very nice! I also want to compliment you on y our shoes and beg…where and who on the shoe??? LOVE them! Thank you Katherine, glad you like it. And my shoes were from Faith, but are several years old now I’m afraid so may be difficult to find!